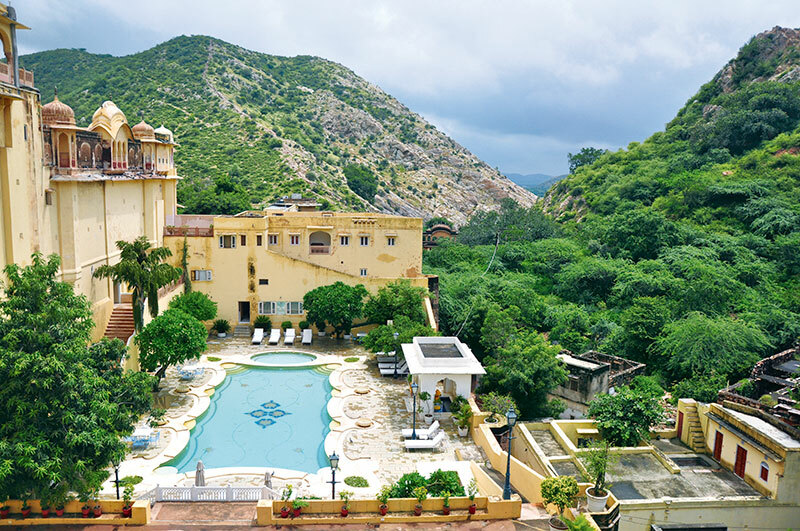 The slightly decrepit Sheogarh Fort from centuries ago, rocky hills, a plethora of flora with monkeys and possibly that of a few wild cats gone astray, frame the 475-year-old Samode Palace, an hour’s drive from Jaipur airport. It wasn’t up until earlier in the 19th century that this royal structure was restored to its imperial condition by Rawal Berisal – from the lineage of Prithvi Raj Chauhan’s 12th son. After his death, his progeny Rawal Sheo continued to multiply this magnificent quotient. The courtyard wears pink and white bougainvillea with dainty poise. From here is a narrow passage, walls of which are lined with the family’s photographs, that leads right up to the Durbar Hall. If you have ever wondered about a royal lifestyle, this is the place to visit. 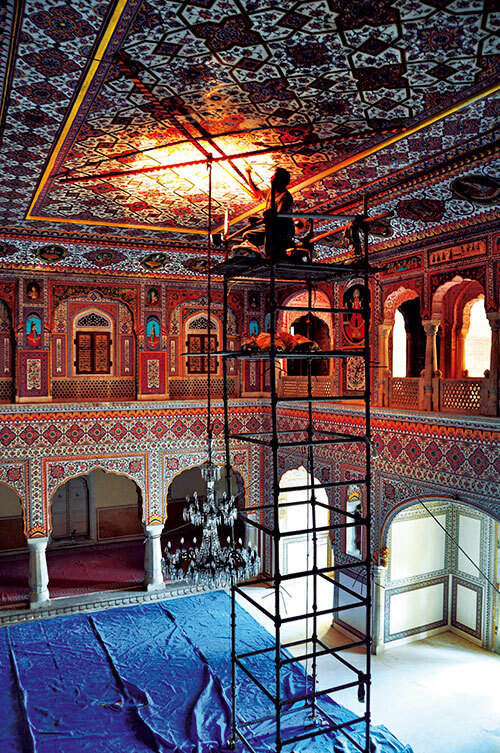 A room paved out of tiny mirrors – Sheesh Mahal – stands as the mark of incredulity as you step in. Continuing into the balcony is as good as walking into a labyrinth of paintings from natural dyes – floral patterns and depictions of hunting, bathing and festivals from the time. But the grandeur continues only when you lean out of the balconies – a heavily dressed hall in earthen coloured local prints from floor to ceiling. Its enigmatic beauty is such that it often saw royalty in former times host their guests here to flaunt their architectural novelty. Quite predictably, the affluent Indian society deems this the perfect venue for celebrations. 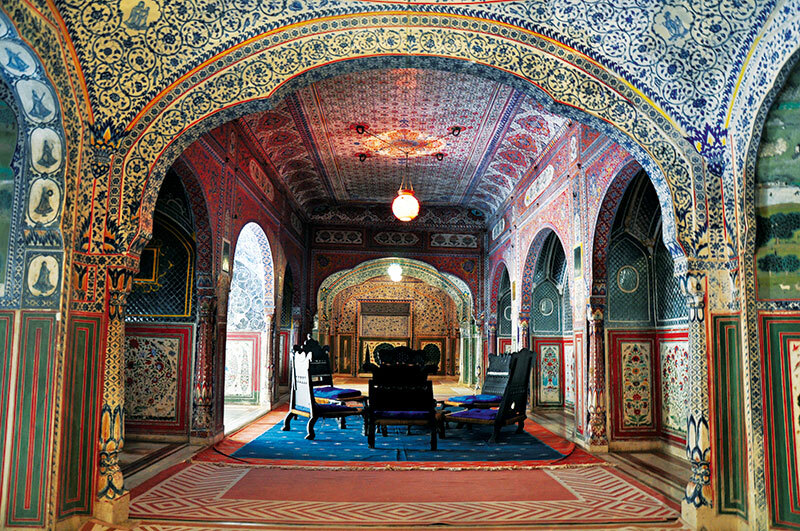 And if a cosy dinner is a request, Sheesh Mahal is lit up with candles and lanterns, emulating a kingly effect. Of course these delicate creations are restored from time to time, for to see them fade away would be an unfortunate loss. Samode makes every effort to employ traditional methods and know-how for the restoration, and incorporates these with modern tools like waterproof paint, special mixes of limestone, et al. Stepping out of here gives the sense of exiting another world altogether. But this is not all, for Samode Palace is known for its Indo-Saracenic architecture that is an amalgamation of Indian and Mughal notes. Sultan Mahal, within the premises, is just as gorgeously robed in intricate blue floral patterns against a pale cream background. A small section shows incarnations of the Almighty himself. Wide open to a clear view of the greenery and naked sky, this one was for the men to entertain, gamble and drink in. Today Samode’s guests find joy in curling up on their sofas with a good book and a hot cuppa. And if it is grub you most desire, just give them a shout and a spoiling of snacking options will follow suit. Samode has two kitchens. Just like how the kitchens in our homes aren’t labelled, these aren’t titled as well. Perhaps the subtext is to let you really sink into a royal sense of being. The rooms are carefully modernised too, just enough to hit the comfort mark, so as not to interrupt the historic pattern running through the property. This is why even the basic accommodation is wrapped in cosy comfort for it was here where the royal family and its close aides used to reside. The all-day kitchen opens at daybreak for breakfast where not one, but a few will check on you through the course. They remember how you like your coffee and will offer you the same on your next visit. Apart from the heart-warming jam, toast and Nutella, there is a range of cold cut meats and other hot regional dishes. 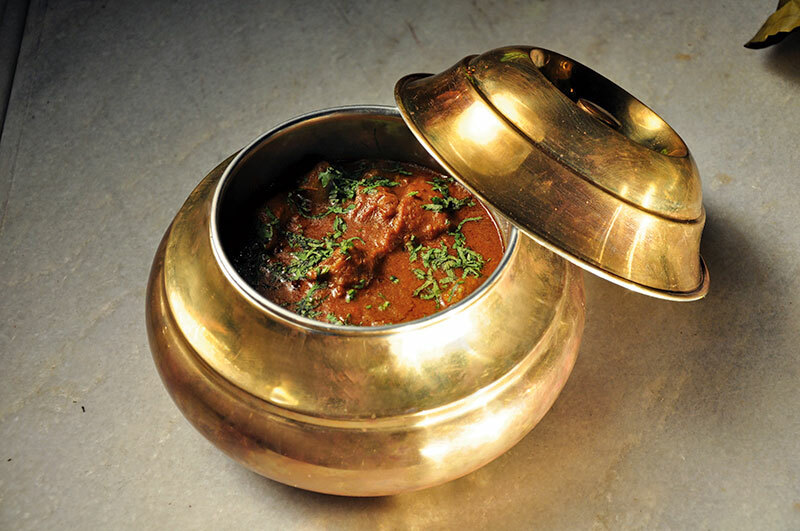 Lunch and dinner is the usual continental and Indian fare – some of which is quintessential to Rajasthani soil. This is built in the recently added section of Samode Palace within the last three decades. Apparently it took the workers all of three months to drill through the wall and into an expanded space. Once that was successful, after quite a bit of struggle, both kitchens were set up with modern equipment. The second kitchen serves Indian cuisine that is put together in a contemporary style. The chef’s amuse bouche – eggplant, carom seeds and hung yogurt – is a quenching starter for the hungry soul. The shikampuri galawat kebab, truth be told, dissolves into the tongue at touch. The breadbasket with missi roti, garlic naan, banana roti and bejad roti are celestial for any foodie. The thandai cheesecake pretty much nudges you to beg for an encore. We have the aloe fritters and ladyfinger tempura, which are extravagances with a twist. 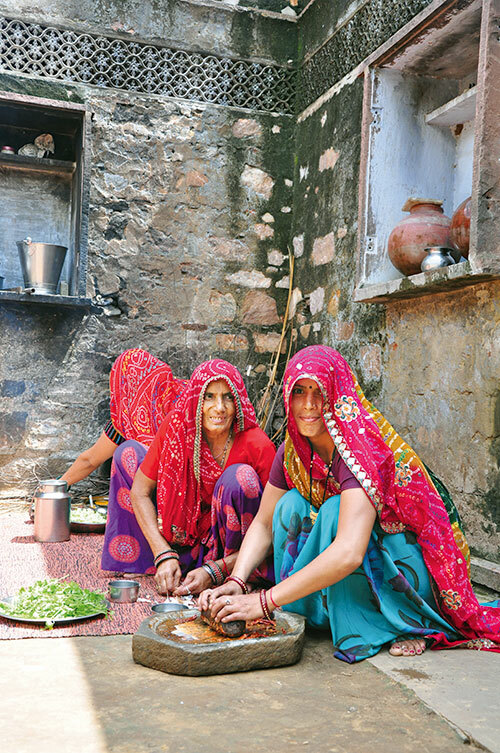 And if local cuisine is a yearning, a trip to Samode village is a necessity. 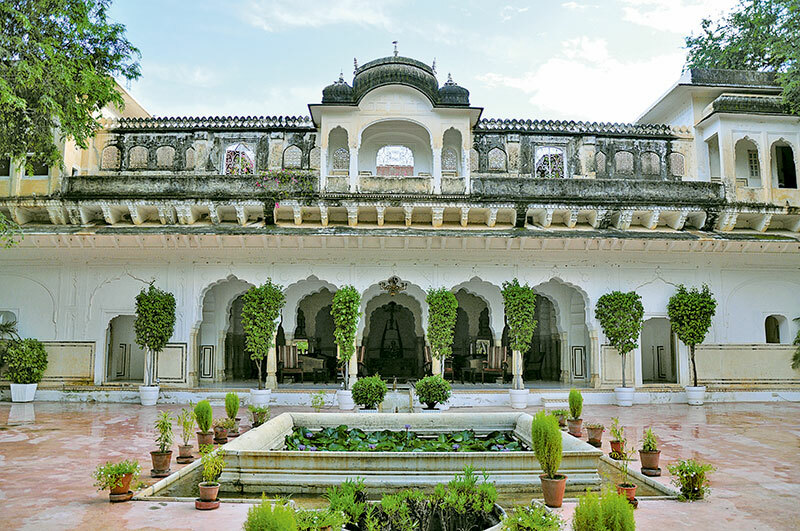 The roads leading to and away from Samode Palace’s gates of luxury are a paradox in itself – unpaved pathways, unmanned cattle and school children shouting out for stationary. To believe that the village is forgotten in the dust of this opulent construction would be a hasty assumption. Just like how Samode used to be under the care of Rawal Berisal, the present generation, Yadavendra Singh and Raghavendra Singh are involved in the development of its schools, hospitals, small industries, source all local produce from here and offer employment opportunities as well. Samode Hotels doesn’t feel the need to make trips to management schools for placement. They have an undying supply of candidates at their doorstep – literally. Most of their employees are grown offspring of those who have served at the palace in the past and some others are from the village itself. Samode’s staff even shows an added interest by making an effort to learn English, French and Spanish so understanding their guests would be effortless. This explains the absence of the usually programmed demeanour in the staff. Each attendant and server brings his own charm to you. And if you are feeling particularly chatty, they will happily accept an invitation for a chinwag. This has often led to a curiosity about what a meal at the village is about. One of the employees has opened his home in the village to visitors for a rustic experience. Driving down through here is as good as a brief tour of evolving rural life. It takes you to a part of Jaipur that is often neglected for the hustle of city life. The white stone mountains with spurts of green and grazing mountain goats are such a picturesque delight. Cows ambling through pastures and peacocks flying wild, oblivious to their royal stature are the reality that one rarely experiences away from books and movies. Finally the food prepared in earthern pots and cooked on wood fire is served against a backdrop of sprawling savannahs, ruminating cows and haystacks as you wash-up in time to soothe a ravenous appetite. Each plate is nicely laid out and accompanied with buttermilk. Any amount of homemade clarified butter is okay to suffocate the hot and fluffy rotis fresh off the stove. And the finale is the rice kheer and the deep fried sweet whole flour dumplings flavoured with aniseed. You may be tricked into believing that your gluttony has led to overeating, but an hour later you will feel just as light as before the meal. Such is the wholesomeness of the food here. Samode Hotels seems to maintain this lightness in their cuisine even at their restaurants. They may be richer in taste and texture, but aren’t far from a homemade creation. Each dish on the menu is inspired by what the Singh brothers have grown up on. Their late Uncle Thakur Ashok Singh Diggi’s family recipe book had everything measured in the ancient units of tola, masha, ratti, and ser. Such was the authenticity of their inspiration. Adding from his own experiences as a passionate chef child, Yadavendra Singh has taken an active interest in planning his dishes with his chefs, consequently allowing us to taste more of Rajathani food from what is limited to those on commercial menus. Rawal Sheo Singh constructed the geometric architecture of Samode Bagh 175 years ago. This is where the royal family used to escape for days of de-stressing, hunting and entertaining. Today its 20 acres of garden land is patterned after a campsite with luxury tents. During winters Samode offers its version of game cooking chicken – khad desi murg (country chicken) – a specialty of dum cooking in a pit lit with wood fire and controlled heat. The chicken is marinated with freshly ground spices, yogurt, garlic, ginger and stuffed with cooked seasoned rice. It is wrapped in rotis and banana leaves and tied with a thick wet cloth. Once sealed completely, it is placed over slow charcoal fire in the pit, which is sealed with wet sand, cooked for two hours – and worth every minute’s wait. If this isn’t enough, a trip to Samode Haveli, where the family resides, has a jewel of a Rajasthani thali with seductive traits. Mutton dahi bada, gosht korma shirazi, dahi baingan, lahsuni palak justify the ravenous slaver. The palate cleansers of pomegranate sorbet and raw mango sorbet have flavours that exceed their purpose. Samode is undeniable a harbour for gluttony.